Visions : On Amazon: Can it sustain this Model? On Amazon: Can it sustain this Model? Amazon came out with its' latest earnings. It is not making money--but it continues to expand into new markets and continues to enjoy high equity valuation. The question is how long can it sustain such a model? Amazon reported its earnings Thursday, but while revenues were right in line with Wall Street’s expectations, the company posted a net loss of $126 million. The company says it will lose between $410 million and $810 million in the next quarter, compared to just $25 million in the quarter a year ago. 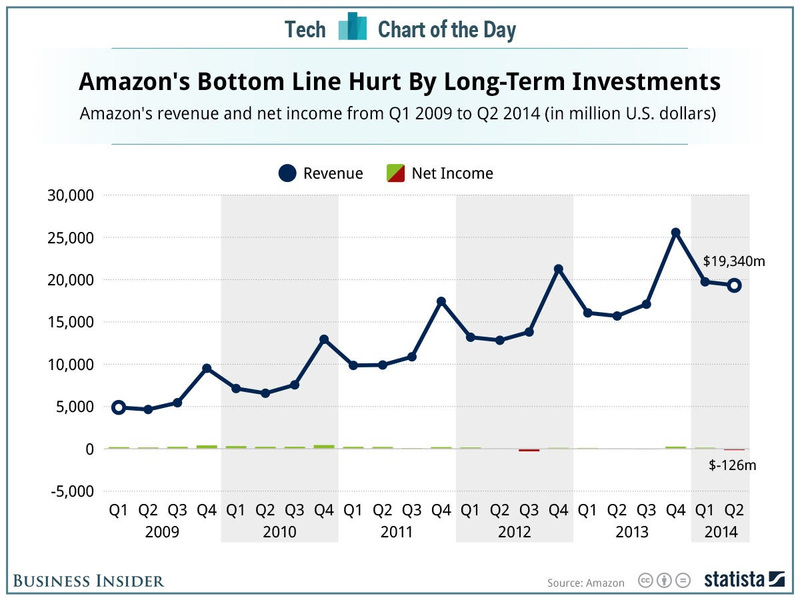 When you look at Amazon’s revenue and income data, which was charted for us by Statista, Amazon rarely posts big profits, as the company continually re-invests its net income back into the company. It may not be great for the company’s bottom line, which might explain all of the company's fleeing investors, but at least Amazon’s revenue keeps steadily growing each year. Already this year, Amazon has unveiled two new consumer devices, including aTV set-top box and a 3-D smartphone called “Fire,” but breaking into new product categories isn’t cheap.